Thanks to the landowners, volunteers, the City of St. George, and critical funding from the State of Utah and the federal government, a museum opened in April 2005 over Shelden Johnson’s initial discovery site south of Riverside Drive. 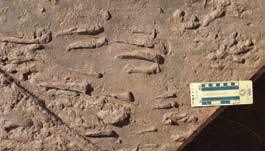 The St. George Dinosaur Discovery Site at Johnson Farm (SGDS) preserves a world-class collection of dinosaur tracks and associated features. The initial discovery and preliminary scientific interpretation of the site were reported in previous issues of Survey Notes (2000, v. 32, no. 3; 2002, v. 34, no. 3). 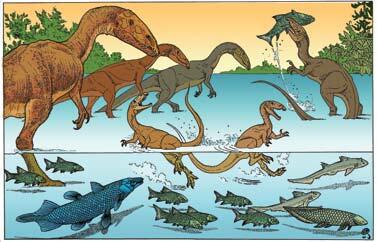 This article summarizes evidence suggesting that dinosaurs at SGDS were feeding on fish. The SGDS preserves not only thousands of dinosaur tracks on at least 25 track-bearing horizons in the basal Jurassic Moenave Formation, but also abundant fish, plant, and invertebrate fossils as well as rare dinosaur teeth and bone. The Moenave Formation at the SGDS provides a window into the earliest Jurassic (about 200–198 million years ago) ecosystem near the margin of a large prehistoric lake—Lake Dixie. The main track-bearing sandstone near the base of the Whitmore Point Member of the Moenave Formation (“Johnson Farm sandstone bed”) preserves casts of dinosaur tracks at its base. This sandstone bed was deposited rapidly on a bed of clay, preserving the fine detail of the clay’s surface. Southeast of Riverside Drive at the SGDS museum, the base of this sandstone exposes casts of mud cracks and dinosaur tracks (mostly large Eubrontes with smaller, nearly identical Grallator type tracks) with isolated scours (flute casts) and diamond-shaped salt casts, suggesting an exposed lake-shore mud flat. Northwest of Riverside Drive, this same surface preserves tool marks, small flute casts, and crescent marks (scratch circles) on an extensively scoured surface; these features indicate relatively strong longshore currents that paralleled the lake shore and exposed mud flat, forming a subaqueous channel. Like in the ocean, longshore currents are created in large lakes by waves obliquely striking the shore. Among the most exciting discoveries at SGDS is an abundance of dinosaur swim tracks (known by the name Characichnos) at the base of the thickened “Johnson Farm sandstone bed” northwest of Riverside Drive representing the subaqueous channel. Here, the SGDS has the world’s largest and best-preserved collection of dinosaur swim tracks, which resolves a long-standing controversy among paleontologists about the very existence of swim tracks. Part of the controversy revolved around the simple fact that if a dinosaur were swimming fully buoyed up in the water, it would not leave marks on the bottom. 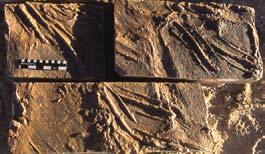 Swim tracks of meat-eating dinosaurs are typically arranged in sets of three parallel scrape marks that taper at each end, with the longer middle toe leaving a longer and deeper scrape mark compared to the shorter outer toes. Most, but not all, of the swim tracks are comparable in size to the smaller walking track Grallator, which here is indistinguishable from small-scale versions of Eubrontes. The vast majority of these swim tracks are oriented in the opposite direction from the current indicators in the channel. The most likely scenario is that numerous meat-eating dinosaurs were wading in the shallows of the lake and stepped off into the deeper subaqueous channel, where the smaller dinosaurs were swept off their feet, resulting in the dinosaurs floundering in the water against the strong current. The abundance of swim tracks leads to the obvious question: Why were so many dinosaurs wading hip deep in the lake? It is certainly a lot harder to walk through water than to walk along a beach. Many fish remains have been recovered at the SGDS from higher in the Whitmore Point Member. 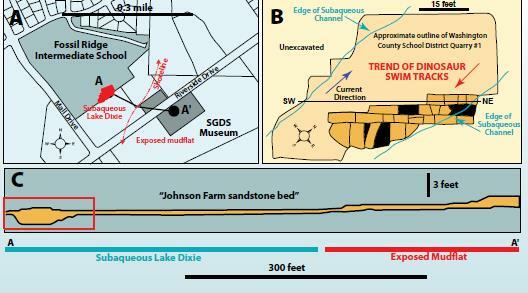 This, along with sedimentological data, indicates that after the top of the “Johnson Farm sandstone bed” was deposited, Lake Dixie deepened and expanded across the area to an eventual maximum extent north of Cedar City and Zion National Park and east to Kanab. How far Lake Dixie extended south into Arizona and west into Nevada is unknown. Many of the fish preserved in the Whitmore Point Member are large and include two new species we named in 2006: the hybodont (spiny, freshwater) shark Lissodus johnsonorum and the lungfish Ceratodus stewarti, both about 3-4 feet long. Other fish include a large coelacanth (lobe-fined fish) similar to Chinlea (about 6 feet long) and abundant semionotid fish as much as 4 feet long, probably all belonging to the genus Semionotus. Semionotus was shaped like a modern carp, but completely covered in a “chain mail” armor of heavy, enamel-covered, diamondshaped scales (ganoid scales) like the modern gar of the southeastern United States. 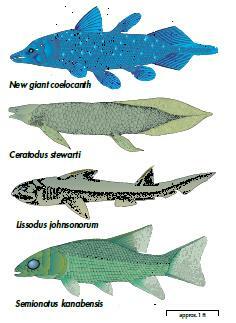 The abundance of large fish lends additional support to the hypothesis that Lake Dixie was a very large lake. 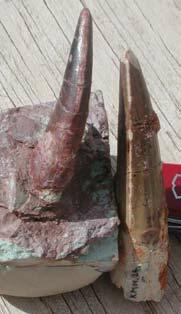 The larger dinosaur teeth recovered from the SGDS are almost certainly from the theropod dinosaur that made the Eubrontes tracks. A well-preserved thoracic vertebra from the SGDS suggests the dinosaur may have been a relative of the double-crested theropod Dilophosaurus, which is known from several specimens in the overlying Kayenta Formation, where hundreds of Eubrontes tracksites are documented. The large SGDS teeth are tall, slender, and typically cylindrical, exhibiting a distinct wear pattern in which the serrated ridges (carinae) along the front and back margins of the teeth are worn from the tip down to the base. We hypothesized this may be from the enamel-on-enamel wear produced by these dinosaurs biting through the “chain mail”-covered semionotids. Spinosaurid teeth from the Early Cretaceous of North Africa are similar and display the same sort of distinctive wear pattern. Spinosaurids are thought to have fed to a significant degree on fish, as indicated by their crocodile-like skulls. The huge semionotid Lepidotes is commonly preserved in the same environments with spinosaurid remains, suggesting that this type of tooth wear is a result of eating fish covered in heavy, enamel-covered scales. The ends of the jaws are expanded laterally to form an interlocking rosette of long teeth at the front of the jaws. Spinosaurids have a similar feature, which is well developed in the Indian gharial—the most fish-eating of all modern crocodilians. Unlike other meat-eating dinosaurs, Dilophosaurus’ nasal openings are retracted back from the front of the jaws. Spinosaurid nasal openings are even more extremely retracted. This characteristic may have limited the splashing of water into their nostrils while fishing. Both Dilophosaurus and spinosaurids have relatively long arms, which, with their well-developed claws, may have helped them catch fish. Finally, the Triassic-Jurassic boundary has been proposed to fall within the Moenave Formation. Dramatic faunal turnover has been proposed for the Late Triassic and, whether as a period of more rapid faunal loss than normal or a mass extinction, the subsequent earliest Jurassic was a very different and apparently more impoverished world biologically. The abundance of large fish in Lake Dixie would have provided an important source of protein in this postcataclysmic world.